New York City plastic surgeon, Dr. Sherrell Aston, also offers NeckTite to address loose and wrinkled skin in the neck area. 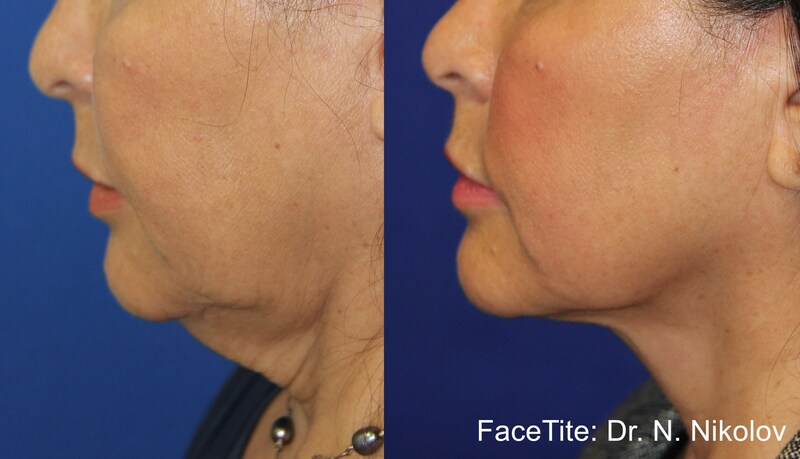 This minimally invasive necklift is done using (RF) radiofrequency energy technology and can transform the appearance of the neck creating a smoother, firmer, more youthful appearance. Dr. Aston uses NeckTite for patients who have droopy and saggy skin on the underside of the chin and neck where skin elasticity is poor. Using the advanced laser, NeckTite can treats the delicate area of the neck with results seen almost immediately (in some cases, up to a 40% improvement with just one session). NeckTite removes excess fat, tightens the skin, and promotes the production of collagen for a gorgeous, contoured neckline without having to undergo a major facial surgery. Both men and women who have lines and loose skin along the neck may benefit from this procedure. It is beneficial for patients who have mild to moderate sagging and who are either not ready for surgery, nor want to undergo a surgical procedure due to scarring or a lengthy recovery. Patients who have lost a significant amount of weight and who have severe sagging in the neck area (such as the "turkey neck" appearance) may be better suited for a surgical necklift, but NeckTite can be an option for many patients who seek a sleeker, slimmer, smoother neck contour. NeckTite is performed using a local anesthetic. This is one of the benefits of this minimally invasive neck tightening procedure as patients do not need to go under general anesthesia. A very tiny incision is made and the NeckTite device is inserted under the skin. Once in place, the heat is applied to the area of desired reduction to accelerate collagen and aspirate the fat cells. Once the procedure is finished, small sutures are used to close the incision area, but the sutures are small and leaves very minimal scarring (if any). As the collagen continues to work and over time, the neck becomes tighter and firmer with a more smoother-looking appearance. Most of our NYC patients only need a single treatment of NeckTite to achieve the results they desire, which is a firm, smoother, and lifted neck area. After the procedure, patients can return to their normal activites pretty soon — we just recommend avoiding strenuous activity and exercise for a couple of days. There will be slight swelling at first, but this goes away quickly. In addition, there is generally no bruising with this procedure. This superior contouring technology of NeckTite is the premier alternative to a traditional necklift and liposucution. The results are long lasting and will leave you with a beautiful, more youthful look. While traditional necklift surgery is a great solution for patients with severe loose in the neck area, there are other options for attaining a younger, firmer neck appearance. NeckTite produces lasting results, does not have post-operative downtime, and leaves little to no scarring. We invite you to learn more about NeckTite today and make your appointment to discuss all of your aesthetic goals with Dr. Aston.